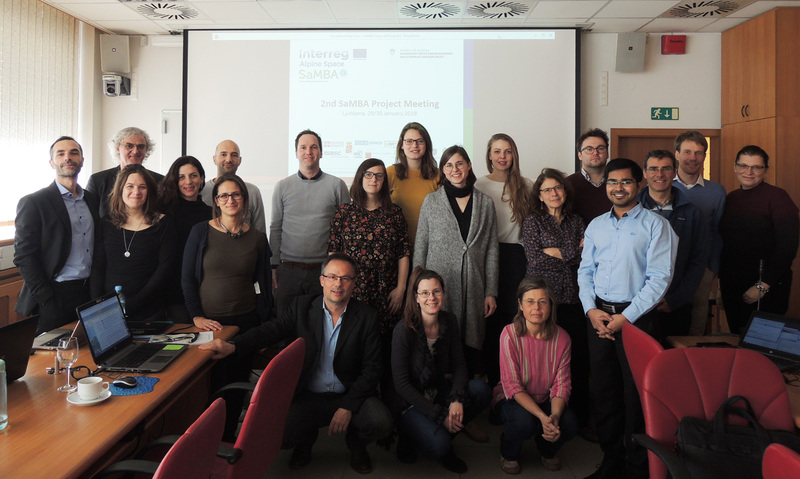 On Tuesday and Wednesday, 29th and 30th January, Faculty of Electrical Engineering in Ljubljana hosted the second meeting for SaMBA, a project that is running in the framework of Interreg Alpine Space cooperation programme. The main general objective of SaMBA is increasing options for low carbon mobility and transport. Laboratory for Telecommunications is contributing towards the realization of this goal in collaboration with several partners from Austria, Germany, Italy, France, and Slovenia. The meeting was organized in a few sections. First thing on Tuesday was to examine the status of work packages, that’s why partners presented the progress in carrying out their assignments. One of the contributions of Faculty of Electrical Engineering to this project is SEROI+ tool, which we presented as a component of one of the work packages. Partners that are tasked with carrying out pilot projects in the scope of sustainable mobility have introduced us to their activities and goals they are trying to meet in this domain. We also got to know two good practice examples: the first one was presented by Toti Di Dio from PUSH design lab in Palermo, and the second one by Marko Zevnik from Sopotniki Institute from Slovenia. The second day was mostly dedicated to a discussion on carrying out national and transnational workshops that will serve to collect data on efforts conducted to achieve sustainable mobility in partner states, and to form general findings. In a recap of the two-day meeting, we summed up the key deliverables and deadlines, and coordinated the expectations of the partners. We concluded the meeting early afternoon with some new conclusions and ideas that will be soon a subject of our next (virtual) meeting. We hosted project TOUREST meeting, Interreg Adrion programme.